Originally from Yellowknife, NWT, I have been living and working in St. John's Newfoundland since 1999. 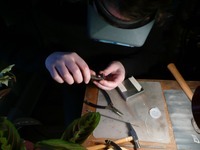 After an introduction to working with silver in Mexico in 2001, I sought out several workshops from esteemed Canadian jewellers such as Orland Larson, Colleen Lynch, Don Stuart, and Shannon Kennedy in order to develop my skills as a part-time jewellery craftsperson. I worked full-time in the industrial welding sector until 2011, when I enrolled myself in the intensive jewellery arts program at Haliburton School of The Arts. Since then my jewellery practice has been my full-time occupation, and I still never find enough time to execute all my ideas! I work with silver, semi-precious stones, copper, bronze, brass, and occasionally textiles, to create sculptural jewellery pieces. Silhouetted images of natural objects suggest to me shadows and moments frozen in time. My inspiration comes from the idea of transition and change, no matter how minute. The outline of a tree in silver, with a stone to represent the sun or moon, is a scene we may view in the natural world as unchanging, but nothing is static; the tree is always growing, the sun and moon always in motion. Silhouetted animal imagery highlights how the existence of the living things we may take for granted can also be fleeting. I like to incorporate unexpected elements in my designs: a bird hidden in the trees, a nest behind bulrushes. The idea of jewellery as sculpture and the use of simpler organic forms inspire my designs. Kinetic components add an element of play to some of my jewellery. I also incorporate semi-precious stones to take advantage of the changeable quality of light, as it can so easily alter and shift our perception of colour. I want my jewellery pieces to invite conversation and reflection on our place in the world. Making pieces that are one of a kind, as well as developing a line of jewellery suitable for production work are my present creative focuses. 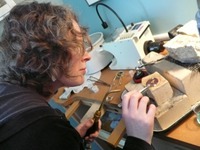 Want to keep up with my current jewellery activities?